Kamila Mistry, Ph.D., M.P.H., Kathryn R. Fingar, Ph.D., M.P.H., and Anne Elixhauser, Ph.D. Consensus guidelines from the American Congress of Obstetricians and Gynecologists and other national efforts to improve perinatal care have shown promise in reducing nonmedically indicated C-sections.14 However, recent research has found wide variation in hospital C-section rates even for low-risk deliveries.15 This variation raises questions about the quality of maternal care and has important implications for maternal and neonatal outcomes and costs for hospitals, delivery systems, and insurers. This Healthcare Cost and Utilization Project (HCUP) Statistical Brief presents information on variation in the rate of total and low-risk C-sections across U.S. hospitals in 2013. It expands on previous studies in two significant ways—by using the State Inpatient Databases (SID) rather than the Nationwide Inpatient Sample (NIS) and by using a new definition of low-risk C-section developed by the Society of Maternal-Fetal Medicine in 2016, which is more clinically comprehensive than other prior definitions available from the Joint Commission and Agency for Healthcare Research and Quality.16 The SID are used because they contain data on a census, or near census, of hospitals in each State and include all discharges from each hospital, making it possible to generate accurate hospital-level statistics. Numbers presented here are not national estimates, but rather actual counts from all States included. This Statistical Brief builds on prior work that examined variations in C-sections by hospital bed size, teaching status, and geographic location using the NIS, from which 593 hospitals were used for analysis.17 In comparison, this Statistical Brief includes data from virtually all hospitals across 43 states and the District of Columbia—2,719 community, nonrehabilitation hospitals in total—accounting for about 95 percent of the U.S. population and deliveries nationwide. Although prior research excluded hospitals with fewer than 100 deliveries in order to ensure that the C-section rate across the sample was sufficiently stable,18 this analysis draws on data from all hospitals except those with 1-9 deliveries (n=51 hospitals) to allow for the inclusion of small hospitals with lower delivery volumes. Deliveries relate to the stay of the mother rather than the newborn. This Statistical Brief presents the rate of C-section per 100 total and low-risk deliveries among women aged 15-44 years. Variation in C-section rates is assessed by examining the distribution of C-section rates across hospitals. Data are presented on minimum and maximum values (i.e., outliers) and the mean C-section rate according to hospital delivery volume. The mean C-section rate is also examined by additional hospital characteristics. Differences of 10 percent or greater are noted in the text. Figure 1 displays the rate (per 100 deliveries) of vaginal deliveries and C-sections among total, low-risk, and non-low-risk childbirth stays at 2,719 hospitals in 43 States and the District of Columbia in 2013. In 2013, there were 3.5 million total and 2.5 million low-risk deliveries across 2,719 hospitals in 43 States and the District of Columbia. These hospitals account for over 95 percent of hospital deliveries nationally. Among all deliveries, the rate of C-section was 33.1 per 100—twice the low-risk C-section rate (16.2 per 100 low-risk deliveries). The majority of all C-sections (65 percent) had a medical indication listed on the record and so were not considered to be low-risk. Among deliveries with a medical indication, the C-section rate was 76.1 per 100. Among hospitals with 1,000 or more deliveries—which accounted for over 80 percent of all deliveries and C-sections—the minimum and maximum low-risk C-section rate differed ten-fold (from 4.6 to 46.9 per 100 low-risk deliveries). In contrast, the total C-section rate differed only four-fold (from 15.4 to 63.5 per 100 total deliveries). The mean low-risk C-section rate was higher among private for-profit hospitals, hospitals in large metropolitan areas, and hospitals in the Northeast and South, compared with other hospitals. The total C-section rate showed a similar pattern by region but did not differ across other hospital characteristics. Figure 1 is a stacked bar chart that shows the rate of total, low-risk, and non-low-risk vaginal deliveries and C-sections in 43 States and the District of Columbia in 2013. 3,535,946 total deliveries; 2,367,225 total vaginal deliveries, 66.9 per 100; 1,168,721 total C-section deliveries, 33.1 per 100. 2,540,190 total low-risk deliveries; 2,128,744 low-risk vaginal deliveries, 83.8 per 100; 411,446 low-risk C-sections, 16.2 per 100. 995,756 total non-low-risk deliveries; 238,481 non-low-risk vaginal deliveries, 23.9 per 100; 757,275 non-low-risk C-sections, 76.1 per 100. In 2013, across 43 States and the District of Columbia, there were a total of 1,168,721 million C-sections, 35 percent of which were low risk. Among the 1,168,721 C-sections in 43 States and the District of Columbia, 411,446 were low risk (35.2 percent). The remaining 757,275 C-sections (64.8 percent) had a medical indication that excluded them from the low-risk category. The C-section rate among low-risk deliveries was nearly 5 times lower than the C-section rate among non-low-risk deliveries. Among all deliveries, the C-section rate was 33.1 per 100 total deliveries. Over three-fourths (76.1 percent) of non-low-risk deliveries resulted in a C-section, which was 4.7 times the rate for low-risk deliveries (16.2 C-sections per 100 low-risk deliveries). The remainder of this Statistical Brief focuses on hospital variation in the low-risk C-section rate, following the approach used in prior reports that present information on the low-risk C-section rate in the context of all C-sections.19, 20 For comparison, the total C-section rate also is presented. These results represent a hospital-level, not a discharge-level, analysis. The C-section rate was calculated for each hospital, and these hospital-level rates form the basis of the results presented. As a result, the mean hospital-level C-section rates (calculated across all hospitals) reported below differ slightly from those in Figure 1, which reports discharge-level C-section rates (calculated across all deliveries). Figure 2 displays the distribution of hospital-level C-section rates among total and low-risk deliveries. In addition to the mean, the 10th, 25th, 75th, and 90th percentiles are noted. 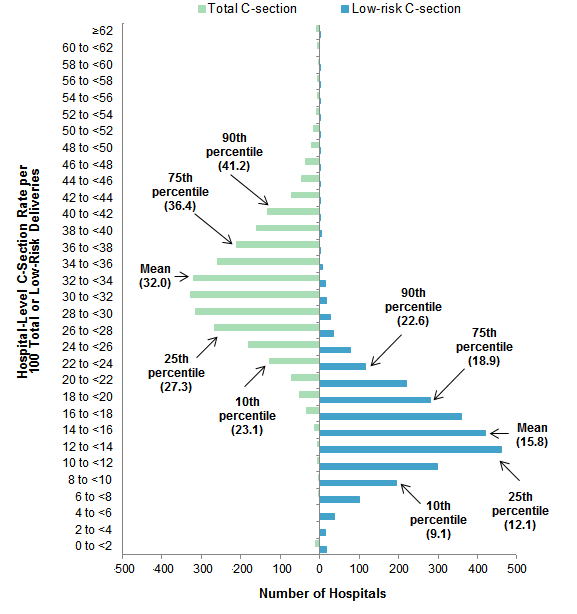 Figure 2 is a bar chart that shows variation in hospital-level C-section rate per 100 total and low-risk deliveries in 2013. Rate per 100 for total C-sections: 90th percentile: 41.2; 75th percentile: 36.4; mean: 32.0; 25th percentile: 27.3; 10th percentile: 23.1. Rate per 100 for low-risk C-sections: 90th percentile: 22.6; 75th percentile: 18.9; mean: 15.8; 25th percentile: 12.1; 10th percentile: 9.1. Across all hospitals, the average total C-section rate was 32.0 C-sections per 100 total deliveries. For 80 percent of hospitals, the C-section rate was between 23.1 and 41.2. In 2013, the mean total C-section rate across hospitals was 32.0 per 100 total deliveries. For 80 percent of hospitals (those between the 10th and 90th percentiles), the C-section rate was between 23.1 and 41.2. The average low-risk C-section rate was 15.8 C-sections per 100 low-risk deliveries. For 80 percent of hospitals, the low-risk C-section rate was between 9.1 and 22.6. The mean low-risk C-section rate across hospitals was 15.8 per 100 low-risk deliveries. For 80 percent of hospitals (those between the 10th and 90th percentiles), the low-risk C-section rate was between 9.1 and 22.6. Table 1 presents statistics on the hospital-level C-section rate for total and low-risk deliveries in 2013, based on hospital delivery volume. Mean C-section rates did not vary substantially by delivery volume. The mean total C-section rate ranged from 30.7 among hospitals with 10-99 deliveries to 33.0 among hospitals with 1,000 or more deliveries. The mean low-risk C-section rate ranged from 15.2 among hospitals with 500-999 deliveries to 16.3 among hospitals with 1,000 or more deliveries. However, these differences were not larger than 10 percent. Among hospitals with an annual volume of 1,000 or more deliveries, the total C-section rate varied four-fold, and the low-risk C-section rate varied ten-fold. In these 43 States and the District of Columbia, there were 1,159 hospitals (42.6 percent of all hospitals) with 1,000 or more deliveries in 2013. These hospitals accounted for over 80 percent of all deliveries. Among these high-volume hospitals, the total C-section rate varied from a minimum of 15.4 to a maximum of 63.5 per 100 deliveries (a four-fold difference). For the low-risk C-section rate, the difference between outliers was even greater—the minimum rate was 4.6, and the maximum was 46.9 per 100 low-risk deliveries (a ten-fold difference). The variation in C-section rates was greatest among low-delivery-volume hospitals. As the delivery volume of hospitals increased, the variation in total C-section rates decreased. Among hospitals with the lowest delivery volume (10-99 deliveries in 2013), the total C-section rate ranged between 16.2 and 46.0 per 100 deliveries for 80 percent of the hospitals, with an overall range in rate from 0.0 to 100.0. In contrast, among hospitals with the highest delivery volume (1,000 or more deliveries in 2013), the total C-section rate ranged from 25.2 to 40.9 per 100 deliveries for 80 percent of the hospitals, with an overall range in rate from 15.4 to 63.5. The low-risk C-section rate followed a similar pattern across delivery volume. Among hospitals with the lowest delivery volume (10-99 deliveries in 2013), the low-risk C-section rate ranged between 5.2 and 27.5 per 100 deliveries for 80 percent of the hospitals, with an overall range in rate from 0.0 to 100.0. In contrast, among hospitals with the highest delivery volume (1,000 or more deliveries in 2013), the low-risk C-section rate ranged from 10.9 to 22.0 per 100 deliveries for 80 percent of the hospitals, with an overall range in rate from 4.6 to 46.9. Figure 3 presents the mean hospital-level C-section rate per 100 total and low-risk deliveries in 2013, by hospital characteristics. Figure 3 is a bar chart that shows the mean C-section rate for total and low-risk deliveries by hospital characteristics in 2013. All hospitals: total, 32.0; low-risk, 15.8. By number of childbirth stays: <100: total, 30.7; low-risk, 15.7; 100-499: total, 31.5; low-risk, 15.5; 500-999: total, 31.3; low-risk, 15.2; >1,000: total, 33.0; low-risk, 16.3. By percentage of Medicaid or uninsured childbirth stays: Quartile 1 (lowest): total, 31.6; low-risk, 15.5; Quartile 2: total, 31.7; low-risk, 15.5; Quartile 3: total, 31.9; low-risk, 15.7; Quartile 4 (highest): total, 33.0; low-risk, 16.4. By ownership: public: total, 31.5; low-risk, 15.4; private nonprofit: total, 31.7; low-risk, 15.6; private for-profit: total, 34.3; low-risk, 17.1. By teaching status: teaching: total, 32.5; low-risk, 16.2; nonteaching: total, 31.9; low-risk, 15.6. By location: large metropolitan: total, 33.3; low-risk, 16.9; small metropolitan: total, 31.6; low-risk, 15.3; micropolitan: total, 31.0; low-risk, 14.8; rural (noncore): total, 31.1; low-risk, 15.4. By region: Northeast: total, 33.6; low-risk, 17.4; Midwest: total, 30.0; low-risk, 14.2; South: total, 34.9; low-risk, 17.8; West: total, 29.8; low-risk, 14.1. The mean rate of C-section among total and low-risk deliveries was higher for hospitals in the Northeast and South compared with those in the Midwest and West. The mean total C-section rate was higher among hospitals in the Northeast (33.6 per 100 total deliveries) and South (34.9) compared with those in the Midwest (30.0) and West (29.8). The mean low-risk C-section rate followed a similar pattern—the rate was 17.4 and 17.8 C-sections per 100 low-risk deliveries in the Northeast and South, respectively, compared with 14.2 in the Midwest and 14.1 in the West. The mean low-risk C-section rate was higher among private for-profit hospitals compared with public hospitals and among hospitals in large metropolitan areas compared with those in small metropolitan and micropolitan areas. The mean low-risk C-section rate was higher among private for-profit hospitals (17.1 per 100 low-risk deliveries) than for public hospitals (15.4). The mean low-risk C-section rate was also higher for hospitals in large metropolitan areas (16.9 per 100 low-risk deliveries) compared with those in small metropolitan (15.3) and micropolitan (14.8) areas. The mean total C-section rate did not differ by more than 10 percent according to ownership or urban/rural location. All other differences shown in Figure 3, including those by delivery volume, percentage of deliveries billed to Medicaid or uninsured, and teaching status, were not greater than 10 percent. The estimates in this Statistical Brief are based upon data from the Healthcare Cost and Utilization Project (HCUP) 2013 State Inpatient Databases (SID) for 2,719 community nonrehabilitation hospitals with 10 or more hospital stays for childbirth in 43 States and the District of Columbia: Arkansas, Arizona, California, Colorado, Connecticut, Florida, Georgia, Hawaii, Iowa, Illinois, Indiana, Kansas, Kentucky, Louisiana, Massachusetts, Maryland, Michigan, Minnesota, Missouri, Montana, North Carolina, North Dakota, Nebraska, New Jersey, New Mexico, Nevada, New York, Ohio, Oklahoma, Oregon, Pennsylvania, Rhode Island, South Carolina, South Dakota, Tennessee, Texas, Utah, Virginia, Vermont, Washington, Wisconsin, West Virginia, Wyoming. Deliveries outside of hospitals included in the SID are not captured in this Statistical Brief (e.g., military hospitals, home births). The results in this Statistical Brief may differ from two prior studies—one on low-risk C-sections22 and one on hospital variation in C-section rates23—because those prior studies used the Nationwide Inpatient Sample (NIS), which prior to 2012 was based on only a 20 percent sample of community nonrehabilitation hospitals from the SID. In comparison, this Statistical Brief is based on data from all community nonrehabilitation hospitals with 10 or more deliveries among women aged 15-44 years in the 2013 SID, which constitute approximately 95 percent of all deliveries in U.S. hospitals. The unit of analysis is the hospital. The number of deliveries at a given hospital is based on the number of hospital discharges (i.e., hospital stays), not persons or patients. This means that a person who is admitted to the hospital multiple times in 1 year will be counted each time as a separate discharge from the hospital. The hospital's ownership/control category was obtained from the American Hospital Association (AHA) Annual Survey of Hospitals and includes categories for government non-Federal (public), private not-for-profit (voluntary), and private investor-owned (proprietary). The hospital's teaching status was obtained from the AHA Annual Survey of Hospitals. A hospital is considered to be a teaching hospital if it has an American Medical Association-approved residency program, is a member of the Council of Teaching Hospitals, or has a ratio of full-time equivalent interns and residents to beds of 0.25 or higher. For other information on pregnancy and childbirth, including Cesarean section, refer to the HCUP Statistical Briefs located at http://www.hcup-us.ahrq.gov/reports/statbriefs/sb_pregnancy.jsp. The authors would like to acknowledge the contributions of Nils Nordstrand and Minya Sheng of Truven Health Analytics. This Statistical Brief was posted online on September 27, 2016. 1 Osterman MJK, Martin JA. Trends in low-risk cesarean delivery in the United States, 1990-2013. National Vital Statistics Reports. 2014;63(6):1-15. 2 Xie RH, Gaudet L, Krewski D, Graham ID, Walker MC, Wen SW. Higher cesarean delivery rates are associated with higher infant mortality rates in industrialized countries. Birth. 2015 Mar;42(1):62-9. 3 Declercq E, Menacker F, MacDorman M. Maternal risk profiles and the primary cesarean rate in the United States, 1991-2002. American Journal of Public Health. 2006;96(5):867-2. 4 Main E, Oshiro B, Chagolla B, Bingham D, Dang-Kilduff L, Kowalewski L. Elimination of Non-Medically Indicated (Elective) Deliveries Before 39 Weeks Gestational Age. Developed under contract #08-85012 with the California Department of Public Health, Maternal, Child and Adolescent Health Division. First edition published by March of Dimes; July 2010. 5 The American College of Obstetricians and Gynecologists Womens Health Care Physicians. ACOG committee opinion no. 559: cesarean delivery on maternal request. Obstetrics & Gynecology. 2013;121(4):904-7. 6 Sakala C, Yang YT, Corry MP. Maternity care and liability: pressing problems, substantive solutions. Women's Health Issues. 2013;23(1):e7-13. 7 Podulka J, Stranges E, Steiner C. Hospitalizations Related to Childbirth, 2008. HCUP Statistical Brief #110. April 2011. Agency for Healthcare Research and Quality, Rockville, MD.http://www.hcup-us.ahrq.gov/reports/statbriefs/sb110.pdf. Accessed August 29, 2016. 8 Burrows LJ, Meyn LA, Weber AM. Maternal morbidity associated with vaginal versus cesarean delivery. Obstetrics & Gynecology. 2004;103(5 Pt 1):907-12. 10 Ecker JL, Frigoletto FD. Cesarean delivery and the risk-benefit calculus. New England Journal of Medicine. 2007;356:885-8. 11 Hobbs AJ, Mannion CA, McDonald SW, Brockway M, Tough SC. The impact of caesarean section on breastfeeding initiation, duration and difficulties in the first four months postpartum. BMC Pregnancy and Childbirth. 2016;16(1):90. 12 Moore JE, Witt WP, Elixhauser A. Complicating Conditions Associated With Childbirth, by Delivery Method and Payer, 2011. HCUP Statistical Brief #173. May 2014. Agency for Healthcare Research and Quality, Rockville, MD. http://www.hcup-us.ahrq.gov/reports/statbriefs/sb173-Childbirth-Delivery-Complications.pdf. Accessed August 29, 2016. 13 U.S. Department of Health and Human Services, Office of Disease Prevention and Health Promotion. Healthy People 2020. Maternal, Infant, and Child Health. https://www.healthypeople.gov/2020/topics-objectives/topic/maternal-infant-and-child-health/objectives. Accessed August 1, 2016. 14 American College of Obstetricians and Gynecologists, the Society for Maternal-Fetal Medicine, Caughey AB, Cahil AG, Guise J-M, Rouse DJ. ACOG/SMFM Obstetric Care Consensus: Safe prevention of the primary cesarean delivery. Obstetrics & Gynecology 2014;210(3):179-93. 15 Kozhimannil KB, Law MR, Virnig BA: Cesarean delivery rates vary tenfold among US hospitals; reducing variation may address quality and cost issues. Health Affairs (Milwood). 2013;32(3):527-35. 16 Armstrong JC, Kozhimannil KB, McDermott P, Saade GR, Srinivas SK, Society for Maternal-Fetal Medicine Health Policy Committee. Comparing variation in hospital rates of cesarean delivery among low-risk women using 3 different measures. American Journal of Obstetrics & Gynecology. 2016;214(2):153-63. 17 Kozhimannil KB, et al. 2013. Op cit. 19 Kozhimannil KB, Law MR, Virnig BA. Cesarean delivery rates vary tenfold among US hospitals; reducing variation may address quality and cost issues. Health Affairs (Milwood). 2013;2(3):527-35. 20 Osterman MJK, Martin JA. Trends in low-risk cesarean delivery in the United States, 1990-2013. National Vital Statistics Reports. 2014;63(6):1-15. 21 Armstrong JC, Kozhimannil KB, McDermott P, Saade GR, Srinivas SK. Society for Maternal-Fetal Medicine Health Policy Committee. Comparing variation in hospital rates of cesarean delivery among low-risk women using 3 different measures. American Journal of Obstetrics & Gynecology. 2016;214(2):153-63. 22 Armstrong JC, Kozhimannil KB, McDermott P, Saade GR, Srinivas SK. Society for Maternal-Fetal Medicine Health Policy Committee. Comparing variation in hospital rates of cesarean delivery among low-risk women using 3 different measures. American Journal of Obstetrics & Gynecology. 2016;214(2):153-63. 23 Kozhimannil KB, Law MR, Virnig BA. Cesarean delivery rates vary 10-fold among US hospitals; reducing variation may address quality, cost issues. Health Affairs (Millwood). 2013;32(3):527-35. Internet Citation: Statistical Brief #211. Healthcare Cost and Utilization Project (HCUP). September 2016. Agency for Healthcare Research and Quality, Rockville, MD. www.hcup-us.ahrq.gov/reports/statbriefs/sb211-Hospital-Variation-C-sections-2013.jsp.